Apple Inc - maker of the iconic iPhone, iPad, iMac and MacBook - seems to have begun to crack the Indian market. The Cupertino, US-based company's revenue from India jumped about 10 times in the financial year ended March 2014 to Rs 4,500 crore from Rs 446 crore in FY10, according to its filings to the registrar of companies. While buyback offers and operator bundling pushed sales, its profit increased three times to Rs 119.5 crore in FY14 from Rs 38 crore in FY10, with expenditure rising 11 times as the company went on aggressive campaigns to promote its products. 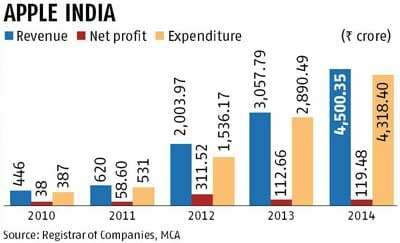 In FY14, Apple's India unit has spent Rs 4,318 crore, which includes all operational expenses, in the country, from Rs 387 crore in FY10. The company recorded a profit of Rs 312 crore in FY12, which shrunk to Rs 113 crore in the next year. 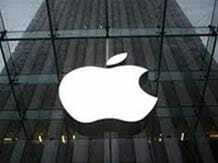 In FY12, Apple India's revenues rose 223 per cent to Rs 2,004 crore and net profit soared 431 per cent to Rs 312 crore. While the company does not reveal its India sales numbers, industry estimates indicate it sold 1.02 million iPhones between October 2013 and August 2014. In the smartphone market, Apple had a mere 1.5 per cent share (volume) in India, at the end of the July-September quarter, down from 2.4 per cent in the previous one, according to estimates by independent research agencies. In value terms, its share was estimated at 5.5 per cent in the July-September quarter in the estimated Rs 40,000-crore smartphone market in India, down from 9.2 per cent in the previous quarter. The market is dominated by South Korea's major Samsung Electronics, followed by domestic firms Micromax and Karbonn. Meanwhile, Apple's India subsidiary has terminated its contract with a reseller and asked three others not to use the sales avenue for the next two years as they had misused Apple's discount programme being offered exclusively to students, according to the company's annual filing to the registrar of companies. According to the filing, a discount of Rs 54.48 lakh was inappropriately availed of by a few resellers. "The company has terminated the contract with one of these resellers and suspended three other resellers for a period of two years from this specific promotional programme. The company has recovered the entire amount from respective resellers," the company's auditor, S R Batliboi & Associates, noted in the audit report. The firm offers students discounts of 10-15 per cent on purchase of MacBooks. In the past few years, Apple has nearly doubled its resellers to about 100. This year, Apple launched iPhone 6 and iPhone 6 Plus in India just before Diwali, only 28 days after it started selling the device in the US. With increasing sales numbers, Apple has also reduced the time-gap between availability of iPhone in the US and India, by 91 per cent. This is a notable development, considering the fact that iPhone 4 came to India 337 days after its US launch, while iPhone 4S came 164 days later, and iPhone 5S and 5C by 42 days later. This time, too, all 55,000 iPhones that Apple had shipped to India in the first batch were sold within the first 72 hours after it started the midnight sales - a first in India - on October 18. Apple's key resellers are Redington, Ingram Micro, Rashi Peripherals and Reliance.